« In the Dugout, South on the Lomami to the Rapids. 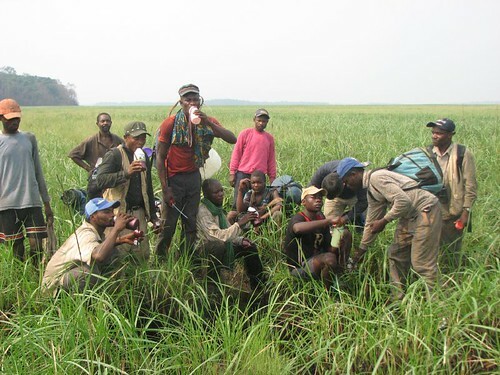 Twelve days walking through forest and savanna and more forest and more savanna. It is a circuit I will never forget. I have always read that forest/savanna borders are particularly rich with species because you get both forest and savanna animals coming together. This circuit certainly was my best ever for observing animals. 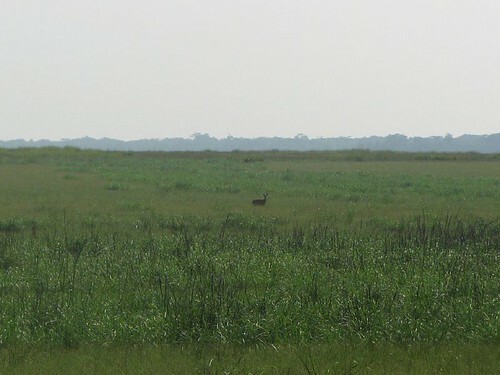 In the savannah we saw buffalo, bongo, a jackal, and quite possible a black fronted duiker. Lots of buffalo. 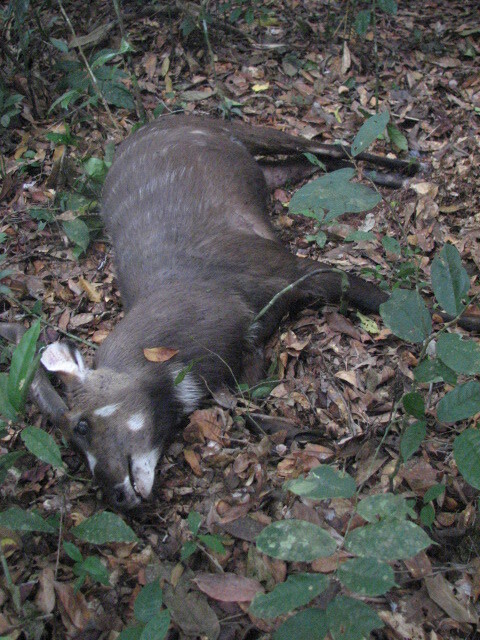 In the forest we saw a dead fully grown male sitatunga (pictured here). It had only recently died. No gun shot wounds so we think it was a snake bite. Blood coming out of its mouth and ears was the only clue. A beautiful huge magnificent beast. A few monkeys were seen but not many. A few snakes also that caused the usual panic by everybody. 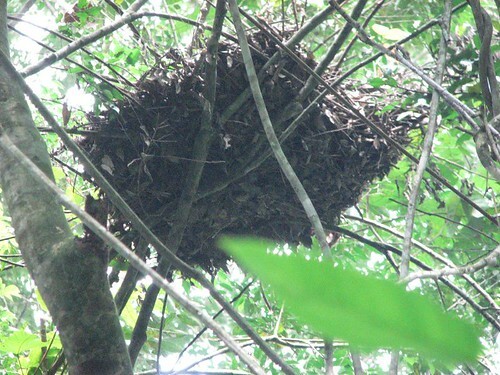 But the best by far was Bonobo nests. Over 300!! Four locations were exceptional. One had about 100 in just a few kilometres and another had about 80 over four kms. Never seen places like this before. 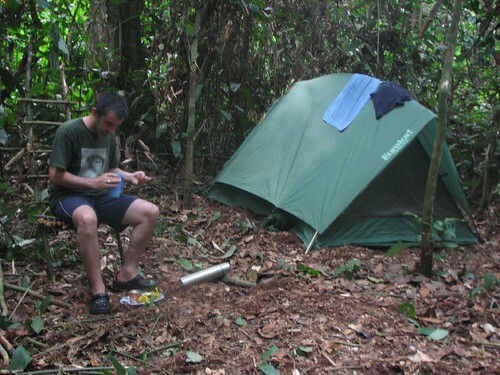 Salonga national park has no corner of forest this rich with bonobo. One of many bonobo nests that we found. This one was old. Sadly no sign of elephants or okapi. Hunted out? The downside, this was physically very demanding. Marching 5 hours in burning sunshine across savanna is a killer and then to arrive at the other end into forest and find no water is demoralizing. It is the dry season and most of the rivers have dried up. We ended up drinking red stagnant water from the few pools we found for 4 days and one day of no water! Luckily no one got sick from this. Not sure how. Back in UK, I’m definitely going to visit the doctor! A much needed and much appreciated drink on the savanna. Getting “water” from a liana for a much needed drink in the forest. We are all back at the base camp along the Lomami now and it is sort of like a Red Cross camp. A lot of walking wounded, me included. One of my feet is a little swollen with a patch of bites from I think some insect that had a field day when I fell asleep one night in my forest chair (see below). One of the porters got a cut on his leg, from a liana, just above his foot. His foot has swollen up like a balloon. He has started on an anti-biotic and we are hoping to see a change soon. He probably cannot carry on but his village is 300km away. What do you do? 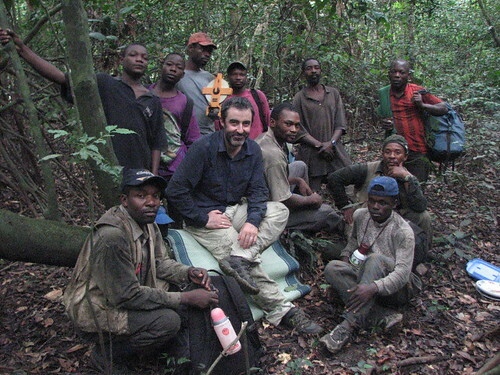 Have just heard from a few locals of a location a few days march from here where there are Bonobo and Okapi. Going to have to go there and check it out. It will also mean that we can check out a bit further south of the rapids where the locals say there are hippos and crocs. This entry was written by Terese Hart, posted on 2007-07-31 at 10:15 pm, filed under Bonobo. Bookmark the permalink. Follow any comments here with the RSS feed for this post. Post a comment or leave a trackback: Trackback URL. 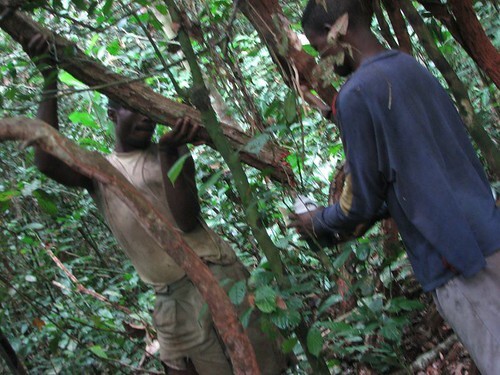 Fascinating news about the Bonobo nests in this area… I am looking for a deserved wild Bonobo conservation charity to do some fund-raising for. This seems a possible solution. please get in touch when you;re back from your trip.. or maybe there is someone in admin who could contact me. Jimmy: Ashley will be back at the end of this month. I will meet him in Kisangani. We are in the first stage of a three stage project. The exploration phase will last until the end of this year and probably well next year. It gives us distributions of animals. Actual inventories will be more restricted geographically and based on exploration results. Inventories will give us population estimates. The final stage involves community engagement and protected area creation. hardly find signs of this animals. True, In an email Ashley sent today he said that although it was ideal habitat the whole area between the Lomami and the Lualaba Rivers seem to be almost without elephants. 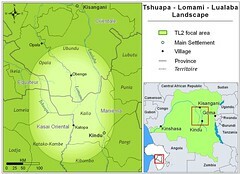 What this project must do is eventually move to create a protected area in the most promising part of the TL2 (Tshuapa-Lomami-Lualaba). It must be promising for bonobo and elephants. 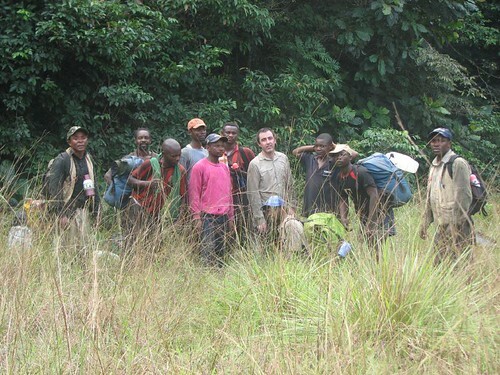 Clearly, though, a major political mobilization to save forest elephants is needed both at the DRCongo level and at the whole central African level. and other animals follow the rain towards the equator, because it seems to be very dry in the south of TL2(in the dry season). am anxiously awaiting another post!! !